A large number of players operate in the global protein supplements market rendering it highly competitive. Considering prospects offer by the market, in the near future it is likely to witness an influx of new entrants. This in turn will make competition fiercer among the market players. As per a study by Transparency Market Research (TMR), market players will aim to boost their businesses on the back of product development and differentiation. Besides this, they are looking to expand their businesses across emerging economies as a prime strategy to gain competitive strength. Several developing nations offer untapped potential, which the market players are aiming to capitalize on in the coming years. According to TMR, GlaxoSmithKline Plc, ABH Pharma Inc., Amway Corp., Nu Skin Enterprises Inc., and Vitacost.com Inc., are some of the prominent companies operating in the global protein supplements market. 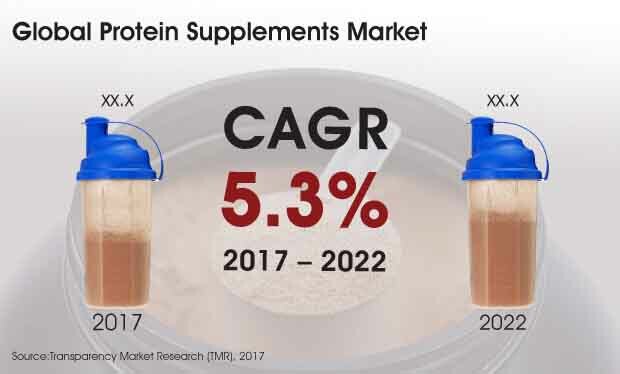 TMR projects, the global protein supplements market toe exhibit a CAGR of 5.30% between 2017 and 2022. Furthermore, the market is projected to reach US$2.8 bn by the end of 2026. Regionally, North America is forecast to remain dominant in the global market through the course of the aforementioned forecast. The rising disposable income of consumers in the region has bolstered growth witnessed by the protein supplements market in North America. As per the report, the demand for protein supplements is likely to increase significantly in North America. Also among protein supplements available in the global market, the demand from supplements derived from animal sources is greater than their plant-based supplements. The intake of protein supplements is rising in response to the surging attention towards fitness. The rising number of gyms, health clubs, and fitness centres connotes the increasing inclinations towards maintaining a fit and healthier lifestyle. This trend is unlikely to wither away anytime soon, which is indicative of a promising future for the global protein supplements market. Weight management is one of the important concerns address in fitness centres. This also results in the increasing demand for protein supplements as they have proven helpful in managing weight. Furthermore, the market is likely to gain from rapid urbanization and the rising purchasing power of consumers. TMR expects the global protein supplements market gain considerable pace in the coming years. It is likely to gain significantly from the rising popularity of several sports and fitness activities. On the downside, fluctuating prices of protein products may hinder the global protein supplement market to an extent. Furthermore, the high cost of these supplement products may discourage their sales in countries with low income. Nonetheless, several companies are trying to price their products more reasonable, which may have a positive impact on the overall market in the coming years.